One PowerPoint training aid created in September 2005 tells trainee military interrogators that prisoners should be stripped before they are questioned. "Get them naked," it says. "Keep them naked if they do not follow commands." Another manual prepared around the same time advises the use of blindfolds to put prisoners under pressure. A manual prepared in April 2008 suggests that "Cpers" – captured personnel – be kept in conditions of physical discomfort and intimidated. Sensory deprivation is lawful, it adds, if there are "valid operational reasons". It also urges enforced nakedness. The 1949 Geneva conventions prohibit any "physical or moral coercion", in particular any coercion employed to obtain information. All the British classified training material was produced after the death of Baha Mousa, the Iraqi hotel receptionist tortured to death by British troops in Basra in September 2003. Some of it was created after a UK army inquiry into the abuse of Iraqi civilians concluded, in January 2008, that while a number of cases had been a cause for "professional humility", ill-treatment had not been endemic. The leak of the material comes at a time when British military detention and interrogation practices are coming under increasing scrutiny. Last month the Guardian reported that British soldiers and airmen have been suspected of responsibility for the murder and manslaughter of Iraqi civilians in addition to Mousa. The victims include a man who was allegedly kicked to death on board an RAF helicopter, another who was shot by a soldier of the Black Watch after being involved in a traffic incident, and a 19-year-old who drowned after allegedly being pushed into a river by soldiers serving with the Royal Engineers. Next month, at the high court in London, lawyers representing more than 100 Iraqis who were held and interrogated by British forces, between the March 2003 invasion and April 2007, will argue that there is compelling evidence that they were tortured in a systematic manner. The abuse, documented by a team of lawyers led by a Birmingham solicitor, Phil Shiner, includes 59 allegations of detainees being hooded, 11 of electric shocks, 122 of sound deprivation through the use of earmuffs, 52 of sleep deprivation, 131 of sight deprivation using blackened goggles, 39 of enforced nakedness and 18 allegations that detainees were kept awake by pornographic DVDs played on laptops. At a preliminary hearing, a high court judge said it appeared to be accepted by the MoD that there were "arguable cases of ill-treatment" and added: "It appears also to be accepted that there is an arguable case of something systemic." The court is not thought to be aware of the recent training material seen by the Guardian, however. This material was created for the instruction of "tactical questioners", who conduct initial interrogations of prisoners of war, as well for the instruction of servicemen and women from all three branches of the armed forces who conduct "interrogation in depth". The courses were run by interrogators operating within a military unit known as F Branch, part of the Joint Services Intelligence Organisation (Jsio), at the Jsio's Bedfordshire headquarters. One PowerPoint aid, entitled Any Questions?, explains that the techniques have been developed over decades by British military interrogators serving in Borneo, Malaya, South Arabia, "Palastine" (sic), Cyprus and Northern Ireland. It explains that interrogators have faced "adverse pulicity (sic), investigations and problems" in the past. During operations in Cyprus in the 1950s, it says, such problems were created by members of parliament, and in Aden by the International Committee of the Red Cross. In northern Oman, trainees are informed, the problems were created by "our own side!". Interrogators are advised to find a discreet place to conduct interrogations, preferably somewhere that looks "nasty". Shipping containers are said to be ideal places that offer "privacy for TQ and Interrogation sessions". The chosen location should always be "out of hearing" and "away from media".One of the documents states: "Torture is an absolute No No." 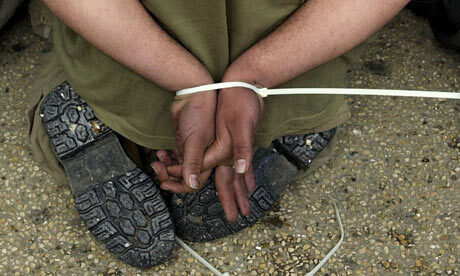 However, it then goes on to recommend methods of ill-treatment that can be employed by interrogators. Prisoners should be "conditioned" before questioning, with conditioning defined as the combined effects of self-induced pressure and "system-induced pressure". Harsh questioning – or "harshing" – in which an interrogator puts his face close to the prisoner, screaming, swearing and making threats, is recommended as a means to provoke "anxiety/fear". Other useful responses include "insecurity", "disorientation" and "humiliation". The training material recommends that after a prisoner's clothes are removed, the interrogator ensures he is searched behind his foreskin and that his buttocks are spread. This is part of the conditioning process, rather than as a security measure. One section of the training course is entitled "positional asphyxiation – signs and symptoms". Baha Mousa is thought to have died from positional asphyxiation caused by a soldier kneeling on his back and then pulling backwards on the hood that was over his head. Mousa also suffered 93 separate injuries while undergoing "tactical questioning" by soldiers of the 1 Battalion Queen's Lancashire Regiment. Addressing the legal status of detainees who may later face prosecution, the material states: "Let the judicial process deal with them after you have finished." Asked about the training material, an MoD spokesperson said: "The Baha Mousa inquiry is examining in detail the MoD's current detention practices, including the training of tactical questioning and interrogation and the MoD has given evidence on this subject. This evidence is a matter of public record and it would be inappropriate for us to comment further outside that forum. We are committed to learning all possible lessons from the inquiry and are giving it our full support." Much of next month's high court hearing is expected to focus on the operations of the JSIO's training unit once it was deployed to Iraq to conduct interrogations of Iraqis. It operated secretive interrogation facilities known as Joint Field Intelligence Teams (Jfits), located inside prisoner-of-war camps. The Jfits had their own guard forces, and refused to take orders from the officers responsible for the main camps. The commanding officer of the first Jfit established by the British military at Umm Qasr, just north of the Kuwaiti border, was a lieutenant commander in the Royal Navy, while most of his interrogators were reservists who had been mobilised shortly before the invasion. According to evidence heard by the public inquiry into the death of Baha Mousa, a number of British officers complained about the mistreatment of detainees at this Jfit facility. One officer told the inquiry he saw about 30 Iraqis who had been forced to kneel in stressful positions, under the sun, with their hands cuffed behind their backs and sandbags over their heads. Some of those officers who complained said they believed the treatment to be inhumane and illegal, while others said it would damage the British military's reputation. One lieutenant colonel told the inquiry he took the view that photographs of the mistreatment "would be extremely detrimental to our image", and recommended that a screen be placed around the Jfit facility "so that practices which might alienate the local population were not publicly exposed".